Attention to detail is what makes this plan special. We included wrapping porches, special ceiling treatments, bay windows, interior columns, built-in bookshelves, and plenty of storage space in this three-bedroom home. With its open, flowing design, The Carlyle entertains as well as it lives. The dining room receives distinction from its tray ceiling, octagonal shape, and columns, while the great room features a fireplace, built-in bookshelves, and French doors that open onto the front porch. 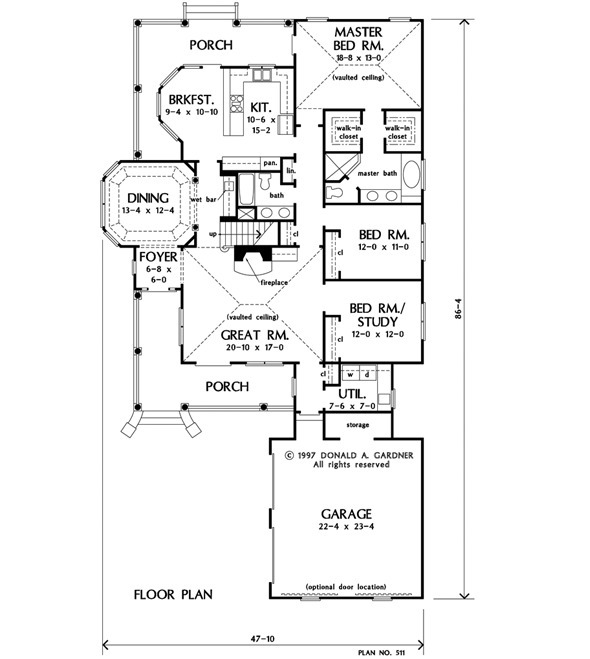 The master suite delights with his and her walk-in closets, back porch access, and a bath with all the amenities. 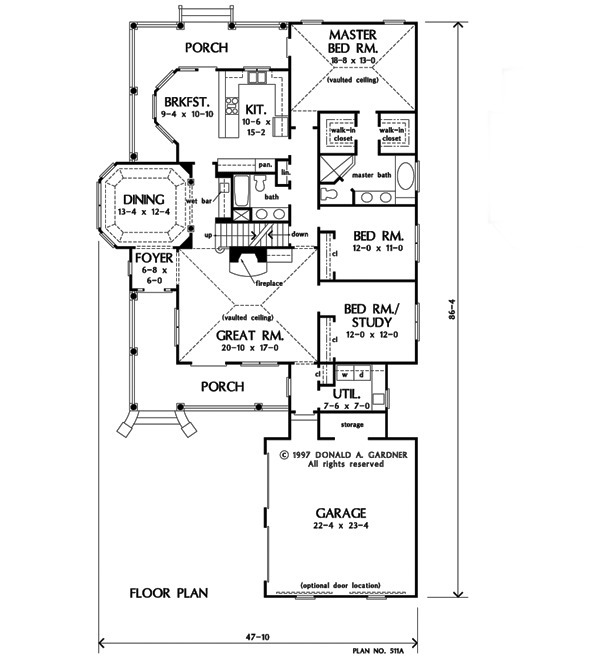 Two additional bedrooms share another full bath, while the upstairs bonus space offers numerous options for expansion. 1st Floor: 2082 Sq. Ft. 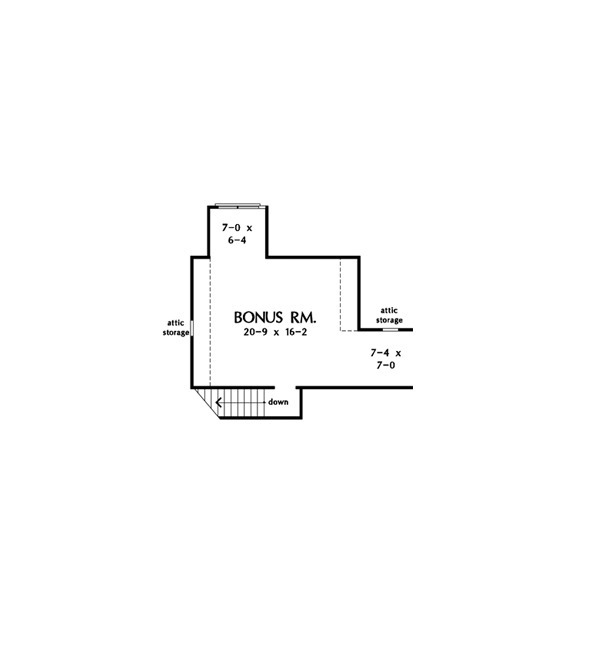 Bonus Room: 466 Sq. Ft.
House Dimensions: 47' 10" x 86' 4"
Great Room: 20' 10" x 17' 0"
Master Bedroom: 18' 8" x 13' 0"
Foyer : 6' 8" x 6' 0" x 8' 0"
Dining Room (Tray): 13' 4" x 12' 4" x 9' 7"
Great Room (Vaulted): 20' 10" x 17' 0" x 14' 6"
Kitchen : 10' 6" x 15' 2" x 8' 0"
Breakfast Room : 9' 4" x 10' 10" x 8' 0"
Utility Room : 7' 6" x 7' 0" x 8' 0"
Bonus Room : 20' 9" x 16' 2" x 8' 0"
Garage : 22' 4" x 23' 4" x 0' 0"
Garage Storage : 9' 10" x 3' 8" x 0' 0"
Master Bedroom (Vaulted): 18' 8" x 13' 0" x 11' 0"
Bedroom / Study : 12' 0" x 12' 0" x 8' 0"
Porch - Front : 23' 10" x 7' 0" x 0' 0"
Porch - Rear : 23' 10" x 7' 0" x 0' 0"